The Genetics Society of America (GSA) is pleased to announce that Steven Farber and Jamie Shuda are the recipients of the 2018 Elizabeth W. Jones Award for Excellence in Education for their extraordinary contributions to genetics education. 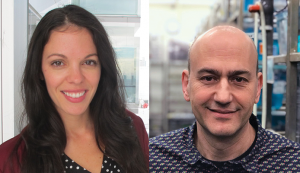 Farber is a principal investigator at the Carnegie Institution for Science, and Shuda is Director of Life Science Outreach at the University of Pennsylvania’s Institute for Regenerative Medicine. Left: Jamie Shuda. Right: Steven Farber.